Can it be? Am I back? Maybe, lol. I have been a busy bee working on lots of other pursuits and even a few other blogs. Personal finance, who knew? But apparently when you have loads of student debt you’re pretty knowledgeable about the pitfalls that got you there and the secrets for digging out. Little by little, I’ve been making changes by incorporating more greens into my diet and reducing the amount of grains i’ve been eating. Which leads me to my current love affair, kale! For those of you that don’t know, kale is the green that’s got it all. Just to sum it up quickly it’s densely packed with fiber, vitamins, minerals and phytonutrients. This little leaf has been shown to have anti-inflammatory properties, lower cholesteral and even prevent and fight cancers. It is definitely worth the google if you would like to learn more. Heat oil, garlic and ginger in a large skillet (or even kettle) on medium until garlic and ginger become fragrant. Add in the kale and soy sauce. Cook until kale has wilted. I like mine with a little bit of crunch left in it. Season with pepper and additional soy sauce as desired. Enjoy! 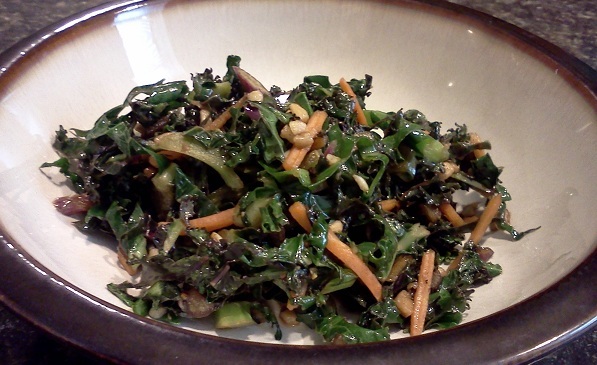 **Note: Kale can be purchased in bulk pre-shredded with carrots from discount chains, like S@m’s Club.